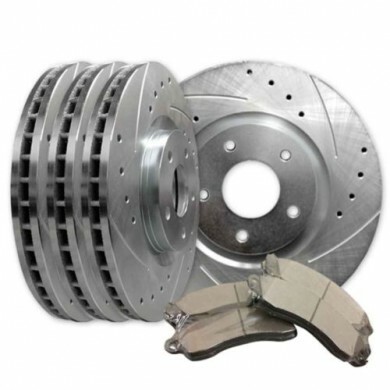 Performance Brake kit includes; Rotors and brake pads. Performance Brake Kit Complete Rotors and Pads This brake kit is a performance, stock replacement for your Jeep Wrangler. For both axles, Drilled and Slotted Rotors and Performance Brake Pads. The perfect upgrade for your Jeep. Upgrade to our Performance Brake Kit and experience results immediately. About 360 Performance Rotors-Machined in the USA! Using premium rotor blanks and state of the art machining processes, 360 Performance Rotors meet and or exceeds industry standard specifications. 360 Performance Rotors utilizes proprietary cross drilled and slotted patterns maximizing out gassing and heat reduction for increased braking performance. All 360 Performance Rotors are zinc plated silver standard, black and gold options are available. Zinc plating prevents brake pad glazing and corrosion for longer rotor life. Outfit your vehicle with performance brake pads that won’t make a mess of your wheels or make annoying sounds. Power Stop Z16 Evolution Clean Ride Ceramic Brake Pads are designed to provide import and domestic cars and SUVs with quiet, vibration-free braking. Q. What is the advantage of drilled and slotted rotors? A. The Cross-Drilled and Slotted Edge combination helps to keep braking systems cooler, thereby reducing heat. Cross-Drilled brake rotors reduce brake fade by venting the gases away from the braking surface. Our Performance Rotors can reduce temperatures by as much as 200 degrees. This heat reduction provides excellent stopping power and a longer brake life, for even the most demanding of driving conditions. Q. Will I need to turn rotors before installation? A. Our Performance Rotors come balanced and ready for installation. There is no need to turn them before installing. A. Tracking information is automatically sent to once we ship your package. A. We do, please email us at info@jonesys.com for details and shipping rates. Q. These brake parts are very inexpensive, am I getting quality parts? A. We only sells the highest quality parts, and we machine all of our rotors in house. This eliminates the “middleman” markup and saves you money. All parts are quality tested and are ISO/TÜV/QS certified as OEM replacement and are the highest standard of rotor excellence. Q. Will these rotors fit the factory calipers and wheel hubs? A. All parts are machined for direct bolt on replacement of the factory parts. Q. What condition are these items in? A. All items are 100% brand new. Q. Will these products require additional modifications or new brake calipers? A. These items are Original Equipment Manufactured (OEM) items and will NOT require any type of additional modifications. Q. What is the difference between our rotors compared to other sellers? A. Our rotors are ISO/TÜV/QS certified and manufactured in a qualified facility in which all parts and materials are inspected and balanced to industry specifications. The difference that sets us apart from other sellers is our off the edge slotted design. This helps to vent heat and gases away from the braking surface to provide excellent stopping power and a longer brake life. Both the appearance and stopping power of these rotors will be beyond your expectations. Q. What is best? Cross-Drilled only, Slotted only, or Cross-Drilled and Slotted? 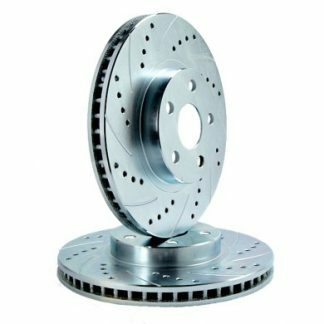 A. Cross-Drilled rotors maximize cooling efficiency and Slotted rotors maximize pad surface braking ability, the combination of Cross-Drilled and Slotted gives you the best of both worlds. Q. What if my lug pattern is different than the picture? A. The picture is only to show an example of our house design; it is not necessarily the rotor you are purchasing. Rest assured you will receive the rotors for the application you are purchasing. All products are hand selected and field tested prior to sale. Products denoted with the Jonesy’s Off Road Fabrication name are produced in house. We only make available products we deem the very best of each category. Jonesy’s Off Road Fabrication is a subsidiary of Jonesy’s Inc. an award winning custom automotive restoration and fabrication business. Ridgefield, WA USA.